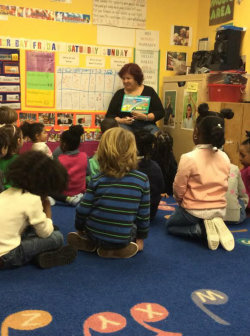 Our Pre-kindergarten program is one of the best you can find in Brooklyn. It is highly convenient for families who need additional childcare. When you enroll your child at HPCDC, you will feel good knowing they are developing good study habits and a lifetime love of learning. Our curriculum promotes the highest academic standards while encouraging creativity and the development of sound reasoning skills. Your child will benefit from our personalized attention and a curriculum that is rooted in the latest research on child development. Our program will get your child ready for school. It will give you and your child security and confidence. The Center’s program of daily activities for four and five-year old children includes both free choice and structured activity with quiet and active periods. The environment is divided into different areas and offers a variety of activities for the children. Social and age appropriate academic skills are shown to the children as they prepare for their lives after their experience at the Center. Providing high quality Pre-K is an important first step towards ensuring that our students eventually graduate high school prepared for the challenges that lie ahead. Research shows that early childhood education has positive effects on academic achievement and career options in the long term. This is why our UPK program is working with the Department of Education in implementing the Common Core Standards and engaging students in meaningful learning experiences that lay the foundation for future success. The Common Core Standards are designed to reflect the knowledge and skills that our young people need for success in college and careers. A common set of learning goals helps teachers and parents ensure students are challenged and making appropriate progress. HPCDC also hosts an annual “School information Night” in which families receive information from administrators and admissions representatives from local elementary schools.